Peeling Grey are LA’s newest noisemakers and their debut release is creating quite the buzz around town, and for good reason! The disc itself starts off with a track that bears the very name of the band, quite a clever introduction. 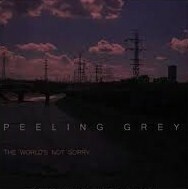 It gives listeners an insight into the world of Peeling Grey; a light but gloomy place that probably hasn’t changed a whole lot since 1981. The dominant guitar and keyboard work on The World Is Not Sorry is very well put together and a bit reminiscent of 80’s post punk stylings of years past. Tracks like James Quarterly and The Strip show off a side of Peeling Grey that may have more in common with the classic UK scene than it does of LA‘s, none the less they are great standout cuts. The light vocal approach heard on most tracks works well with the bands mellow vibe and the various tempos and drum patterns give this album quite a variety for being a debut release from a new band that hasn’t existed all that long. Some of the songs that made it onto The World’ were previously floating around on a demo cd; though now in their realized form it’s a pleasure to hear how the band has evolved. With closing tracks The End of the Road’ and Faith in Forever’ it is easily recognizable that Peeling Grey has loads of potential and are most certainly an exciting band to keep your eye on. I’d recommend this album to any fan of The Chameleons, Siouxsie and The Banshees and anyone into post-punk in general.